Resizing your Photo or Drawing and Printing it at Home. A Solution! 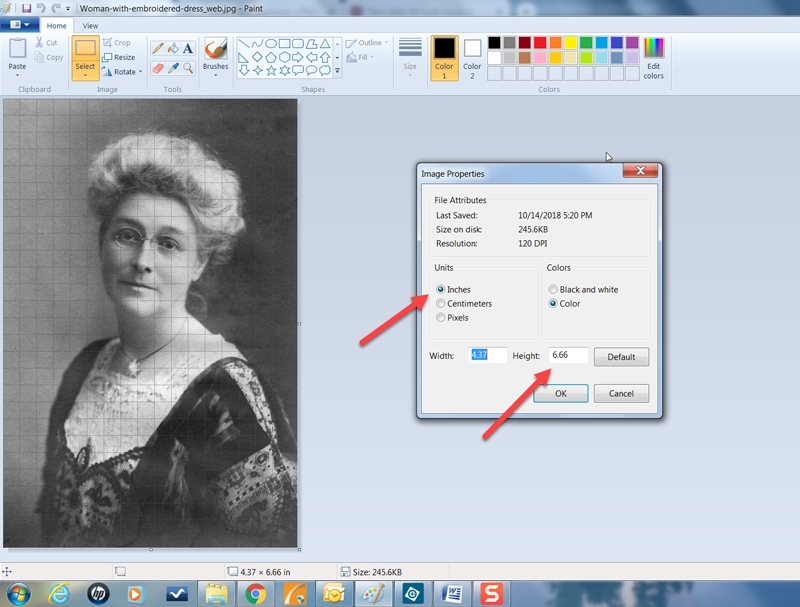 Have you wondered about enlarging a picture to print on multiple pages at home? 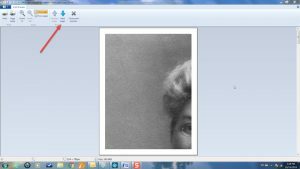 One of the big issues when teaching a portraits workshop is finding a way for students to easily resize and print their photos. I have suggested a variety of options such as Block Poster (not really accurate enough for what we want to do), taking the photo to a printing shop or Staples. 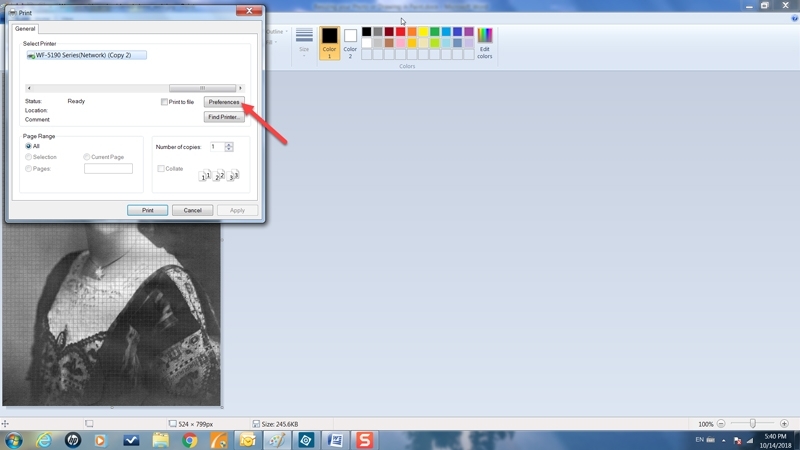 Or using a program such as Rapid Resizer. I resize photos all the time for my portraits and use Rapid Resizer to enlarge and print them. This is a great program and I will continue to use it. But I wanted to find a simpler, cost-effective solution for my students! Recently I was at a Fibre Art Network Conference and had a wonderful time catching up with other members. A big part of the conference is sharing information. 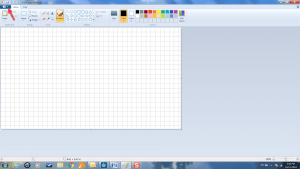 Terry Aske mentioned that she uses a program called Microsoft Paint for enlarging and printing her patterns. 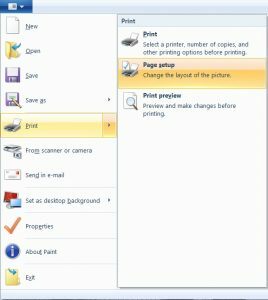 Paint is a program that comes pre-installed on Windows computers. Terry was kind enough to send me the instructions that she gives to her students. I have taken them and added detail and photos to make it super easy to follow along. and under Windows Accessories in 2010. 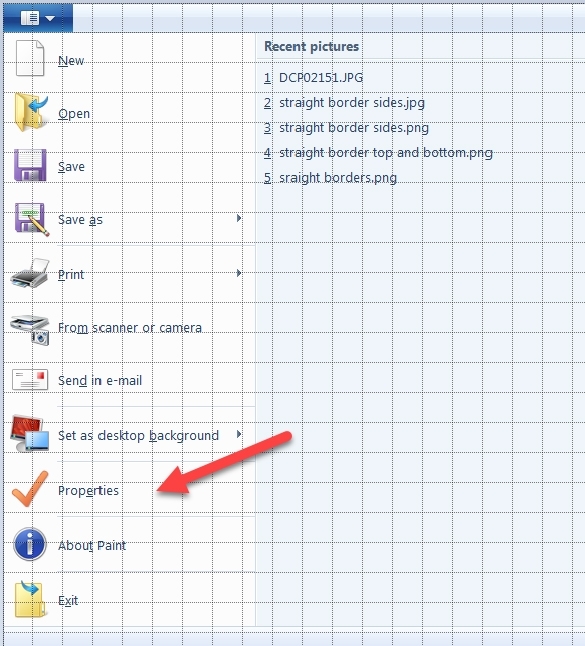 Open your photo in Paint by clicking on the file icon arrow in the upper left and choosing “Open”. 2. 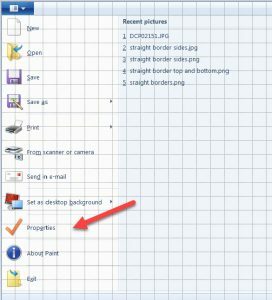 Browse to where your photo is on your computer, select the photo and then click “Open”. 4. Click on the circle next to “Inches“. It will be black when you click on it. 5. Note the size of the photo shown in the boxes. The key measurement for portraits is the height. Changing the height will resize the rest of the photo. 6. Determine what size you want your full-size photo or drawing and thus how much you need to enlarge the photo (percentage). The current size of your photo is 100%. So if your photo is now 6” H and you want it 18” H, you would set the percentage increase at 300% (18 divided by 6 =3) and 3 x 100, so the photo would be enlarged by 300%. 7. Next, click the file icon again and select “Print” – “Page Setup”. 8. Check that you have set the “Orientation” for the direction you want – either Portrait or Landscape. 9. Find “Scaling” in the lower right and then click on “Adjust to” and enter the percentage for enlarging. Click OK. The orientation for the above photo is “portrait”. 10. 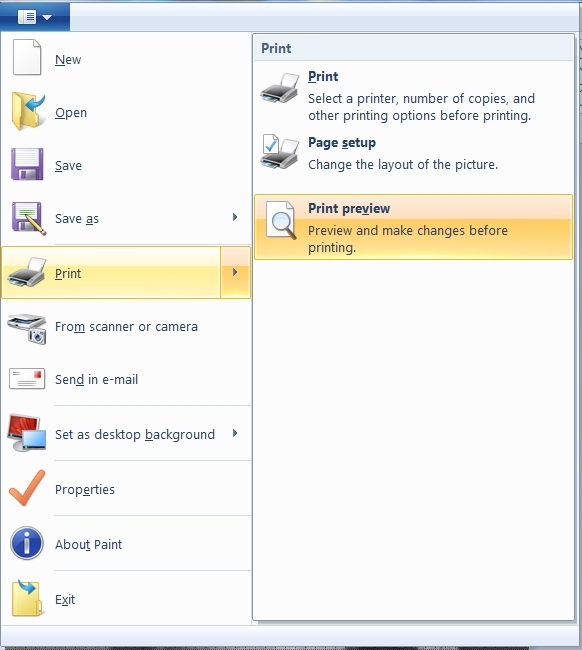 Click on the file icon and select “Print” – “Print Preview”. 11. 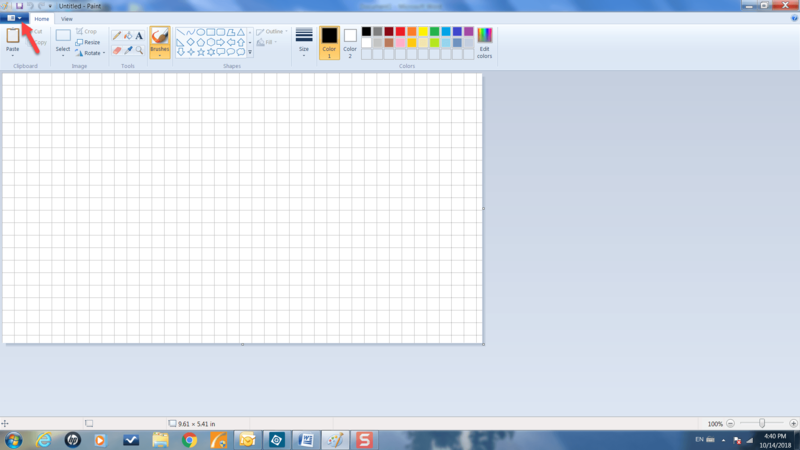 Look at the enlarged photo or drawing and check that it isn’t too pixelated to use. You can also see how many pages will print by counting the pages that you view (click on the down arrow repeatedly). 12. 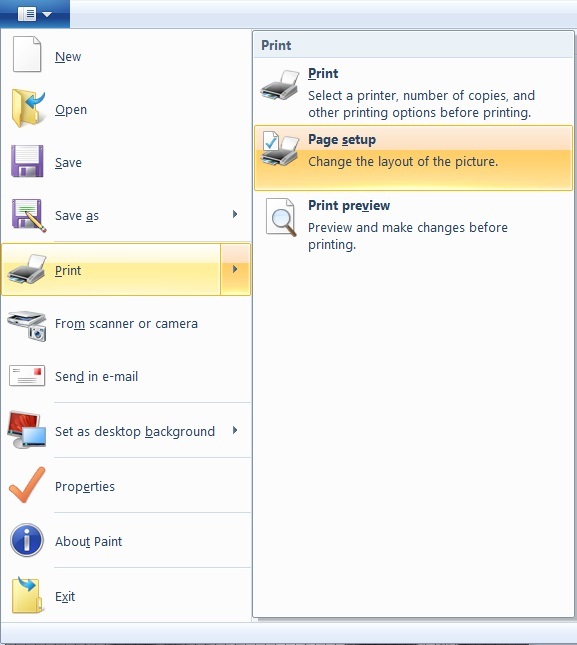 To print: select “Print” and choose the size of paper that you want to use (letter or legal). You can usually find this setting under “Preferences” and then click on Print. 13. Lay out the printed pages and number them in the order that you want them. 14. Trim the borders, allowing some overlap for the adjacent page(s) and tape them together in order. 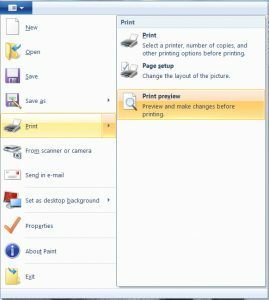 I have presented here a simple way to enlarge and print your photos or patterns at home on your own printer. I would love to hear what you think about this idea and what solutions you may have found. Leave a reply below! This entry was posted in Portraits on October 14, 2018 by Valerie Wilson. How do you come up with the best facial expressions in a portrait? 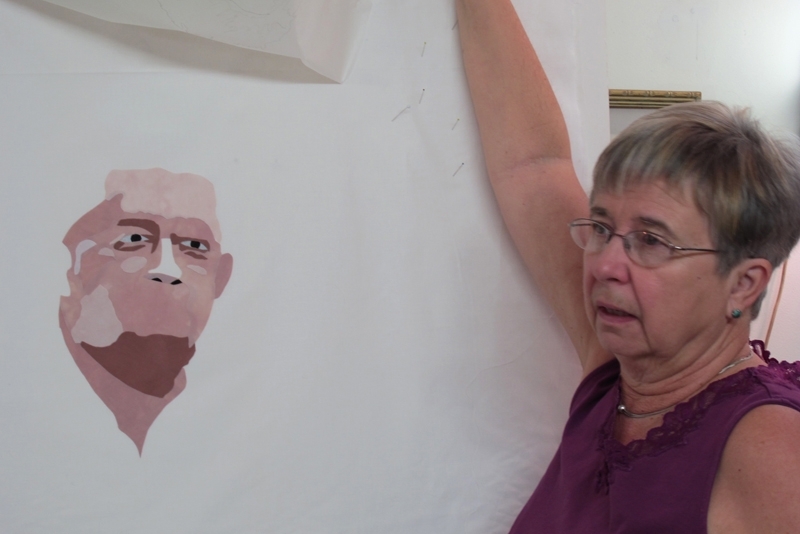 Here is a new way of creating faces that will make it easier for you to get a good likeness in your portrait. 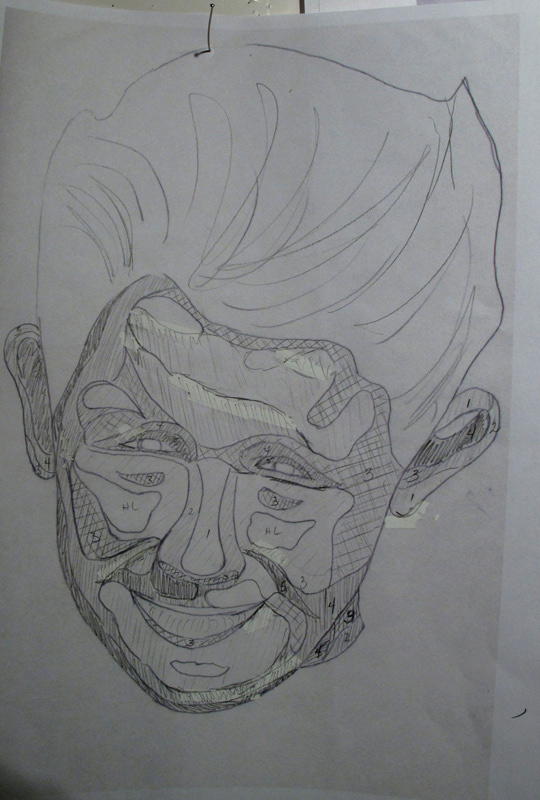 In the past, I traced the contours of the faces from the enlarged photos and then determined the values. I proceeded from there by creating the face out of fabric. I found that I wasn’t always totally happy with the results, particularly if I had too large a section of highlight. So, what to do? 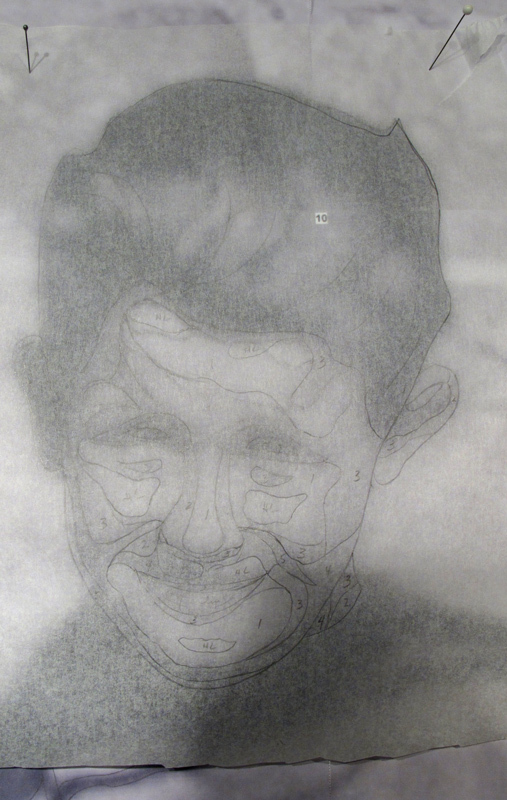 I started in the same way by tracing the face, but then photocopied and printed the traced image, so that I had a copy that I could alter without changing the original. 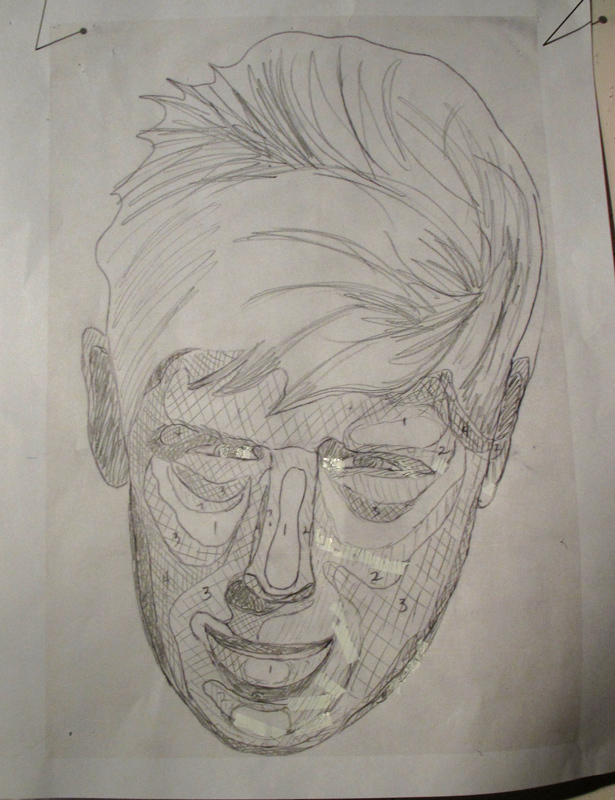 I shaded in the face based on the values that I wanted and then checked to see whether I liked the result. You can see the numbers that I use for referencing the different values. The only problem with this method is that the photocopy doesn’t erase like a pencil drawing would. You can see the White Out that I used to remove some of the lines. Once I have what I think is the best result, I lay the tracing, as seen above, back over the photocopy and adjust the lines on my original tracing. 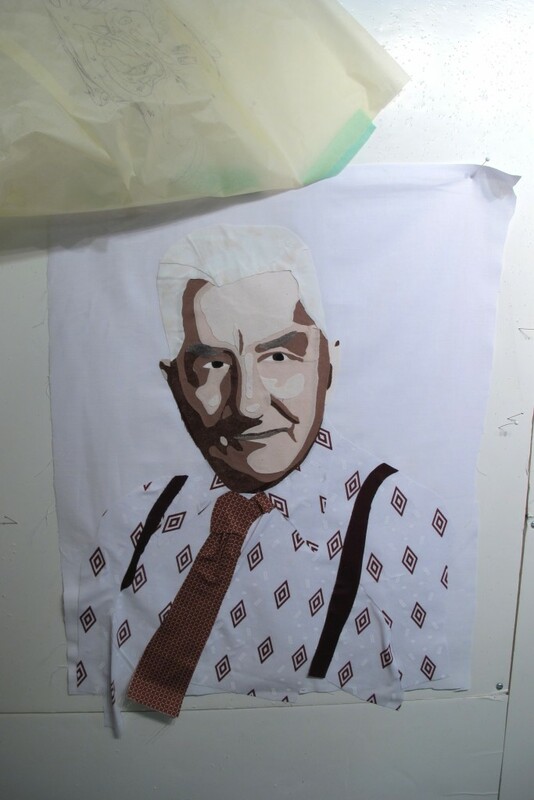 I use this traced image for the placement of the fabric pieces. 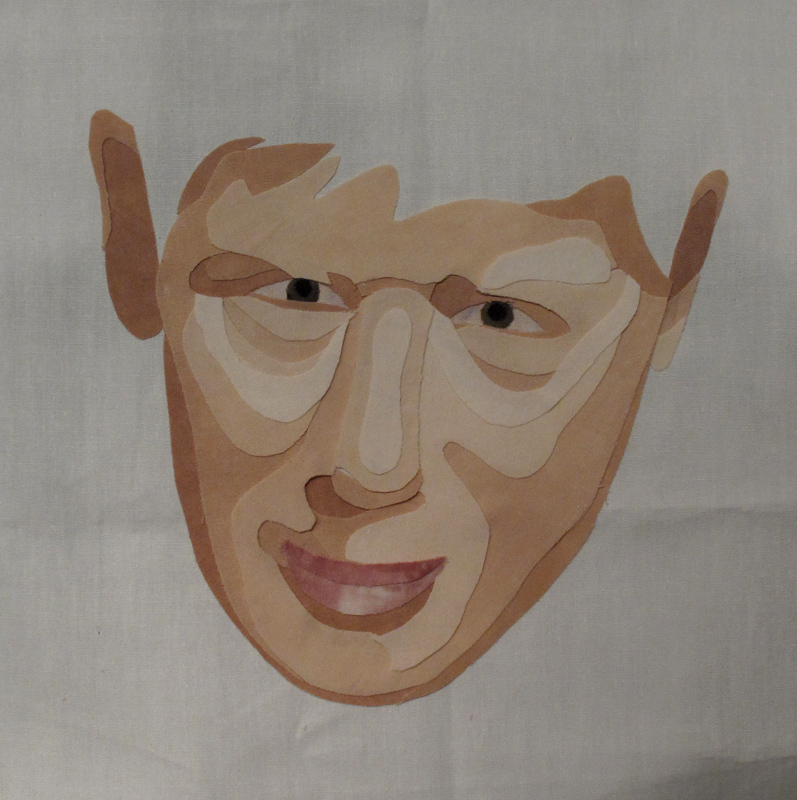 Boy’s face recreated in fabric. I really like this method as I readily notice any odd lines, or shapes, and can double check the values that I have selected before I start cutting up the fabric. These boy’s faces were difficult to create. The original photo had all the boys looking into the sun and their eyes were all squinty and the faces were somewhat overexposed. This is the time when a good book on sketching comes in handy. I am currently using “The Big Book of Realistic Drawing Secrets – Easy Techniques for Drawing People, Animals and More” by Carrie Stuart Parks & Rick Parks. It has really clear visuals for sketching and is a great reference for facial expressions. What do you think of this method? Do you sketch your pictures first? What is your favourite reference book? This entry was posted in Portraits on November 5, 2016 by Valerie Wilson. She’s a Cutie! 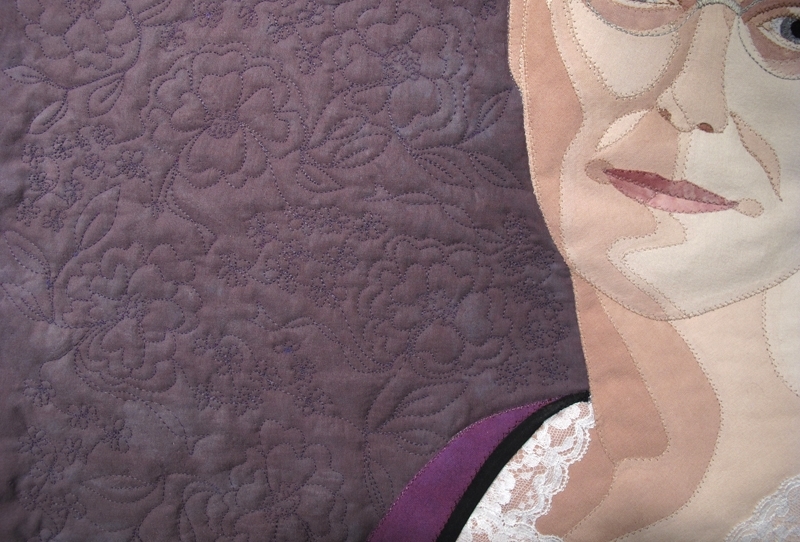 My Latest Portrait Quilt Completed. 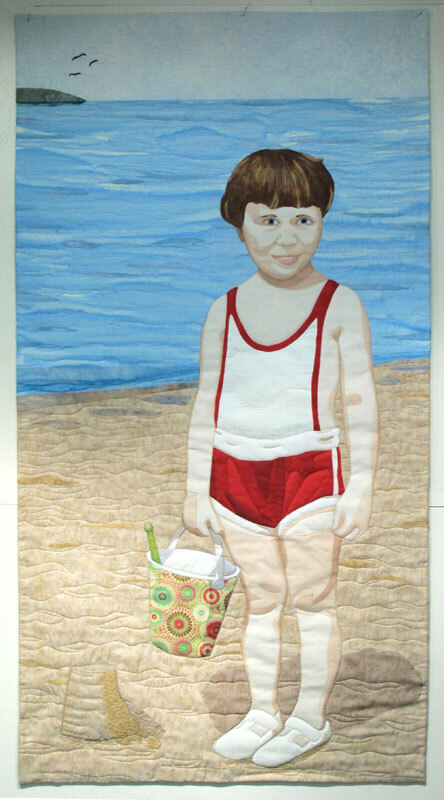 I have finished my latest portrait quilt, the little girl at the beach, and decided to call the quilt “Summer Fun”. She has turned out to be quite cute! I love her sparkly blue eyes and her sweet smile. Now I have to decide what the next one will be. I have two pictures that I am considering. One is a little girl sitting on a porch, and another is one of three boys in hockey uniforms, circa 1934. Subscribe to my blog, and find out what is next! 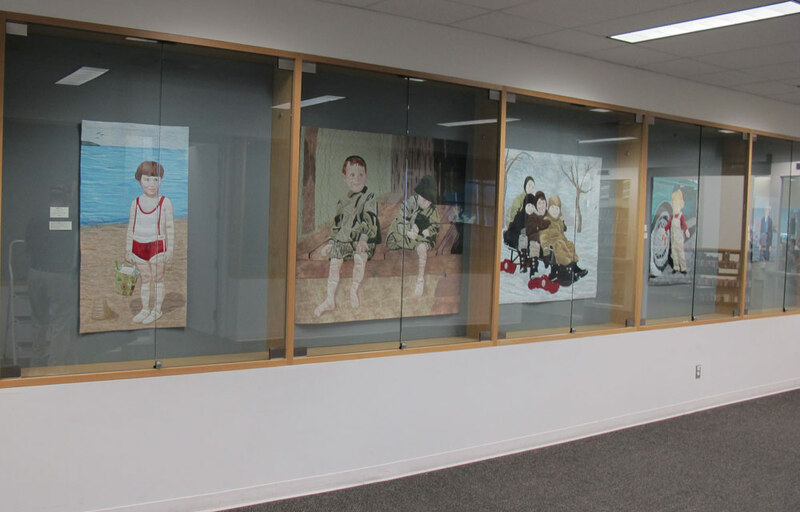 “Summer Fun” and a number of my other quilts are currently hanging in the Blankstein Gallery, on the second floor of the Millennium Library in downtown Winnipeg, MB. 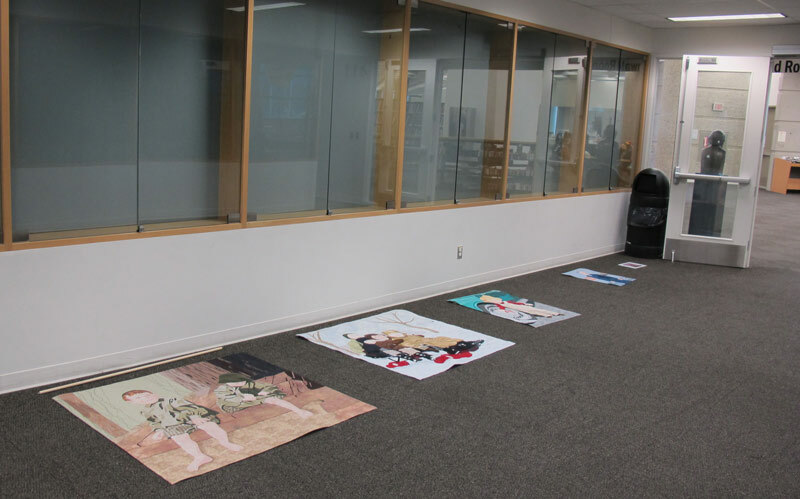 Here are a couple of photos of the preparations for hanging the show and a few of the quilts. It was wonderful to see them all hung. I hope that if you are in the area you can check it out! 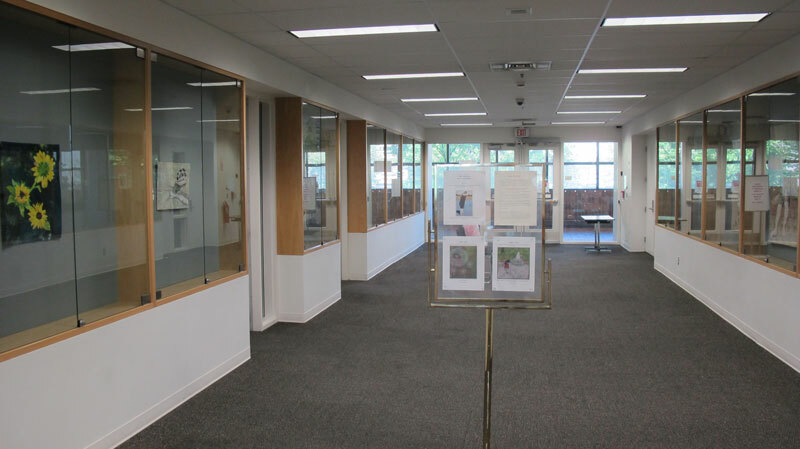 The gallery is open during library hours . 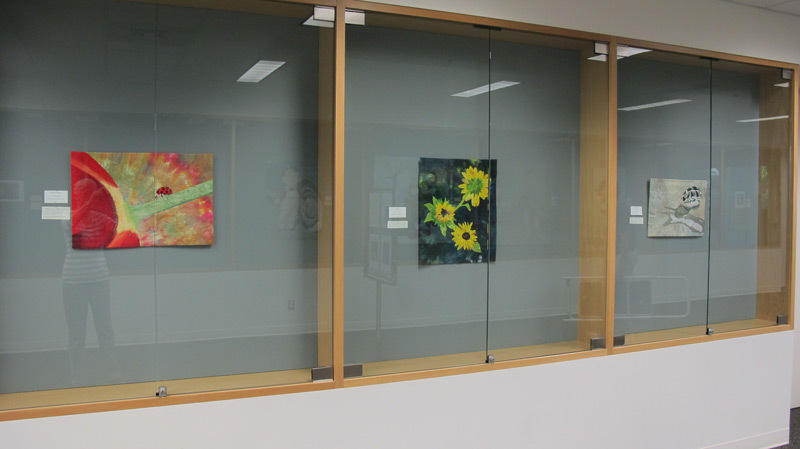 The exhibit runs from August 3 – 30, 2015. This entry was posted in Portraits and tagged children, exhibits, portraits, vintage clothing on August 4, 2015 by Valerie Wilson. After I posted my progress on the little girl in the sunsuit, I decided she was in fact rather an “ugly duckling”. I spent a couple of days, filled with angst before I figured out what was wrong. Then came a number of changes to her face, hair and her eyes (I straightened them) and I like the result. Part of the problem was the lack of eyebrows (see the previous post). Also, I felt that her hair looked too orange, so out came the Tsukineko inks. I figured that if I hated the changes, I could always give her new hair. I am pleased to say that all worked out well! The new colour looks better and the highlights and shadows are in place. She also now has feet and shoes which helps. Don’t you just love her strappy sandals?! I am now creating a beach scene in the background, complete with a sand castle! So far, I only have a piece of paper standing in for the sand castle, as a prop, to see how it will fit into the scene. I didn’t have a fabric that I liked for the water, so I painted some white fabric with Setacolor transparent paint. I love the look of the rolling waves. A small island in the distance helps with perspective and I have pinned a piece of multicolour fabric in place, as a test, to see if I like it for the sand pail. If this piece is like any of my other works in progress, it will undergo several more changes before its final look. 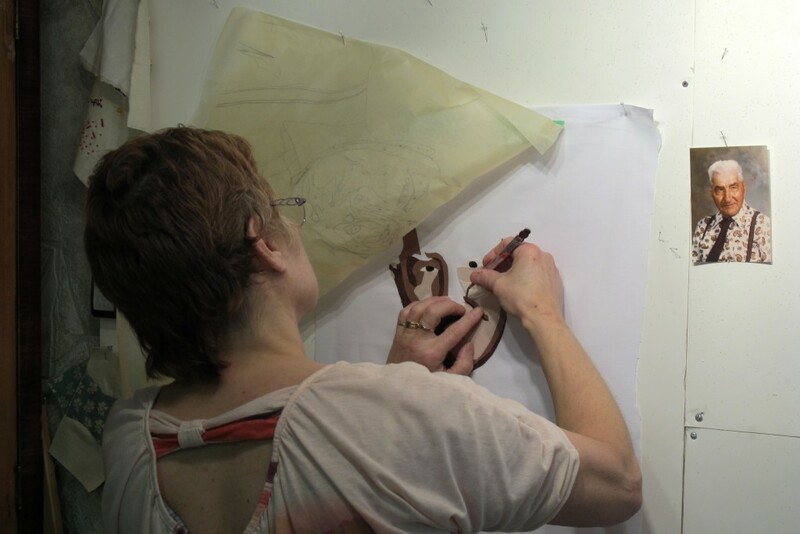 Do you go with the flow when you are working on a piece, or do you have a plan and stick to it? I would love to hear your thoughts on this subject. Please comment. This entry was posted in Portraits and tagged children, portraits, Tsukineko inks, vintage clothing on July 14, 2015 by Valerie Wilson. Well, I didn’t get them all sewn down before I left for Quilt Canada, but I was happy with what I had done. I knew, that I only had a few more pieces of fabric to sew down, once I got back home. The plan is to get these guy done by mid-June, for my solo exhibition, so I have to concentrate and work hard! The kids were cut off the backing that I had used – in this case, stabilizer. I will never use this again as it is too stiff, and wrinkles badly. Lesson learned! I was able to cut some of it away but left the rest in place. The kids were then placed on the background that I created. I found a lovely fabric, at a local quilt shop, that looked to me a lot like falling snow. Wonderful for the sky! The trees I had painted were appliqued to the background. I played with positioning them as I wanted them to act as a frame for the kids on the sleigh. Then on to sewing everything down. It always surprises me how long it takes. Why I don’t know, as I have done this many times. Maybe wishful thinking that it will be faster this time! As seen below this piece had more snow added and further detail on the faces. The next step is the quilting. 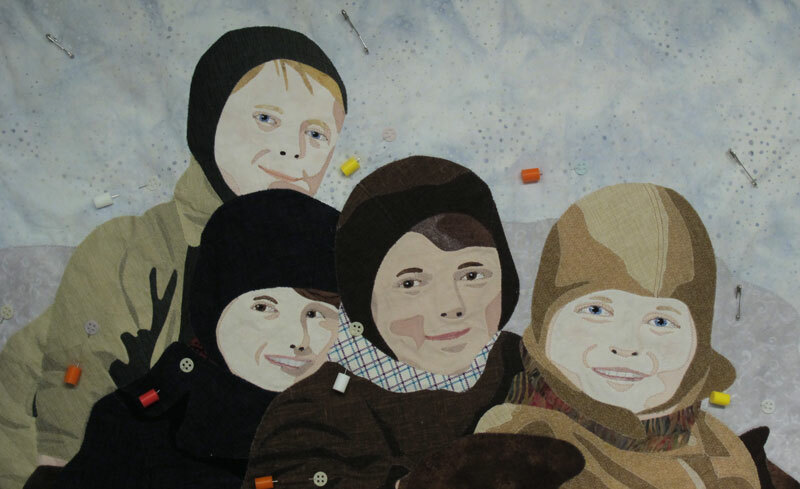 First, the detail quilting the boys, and then on to the background. I always have a hard time coming up with names for my art. Is this a problem for you too? I am trying to think of a name for this quilt. Perhaps the Four Musketeers. What do you think? What name would you give this piece? Can you help me out? I would love it if you would! 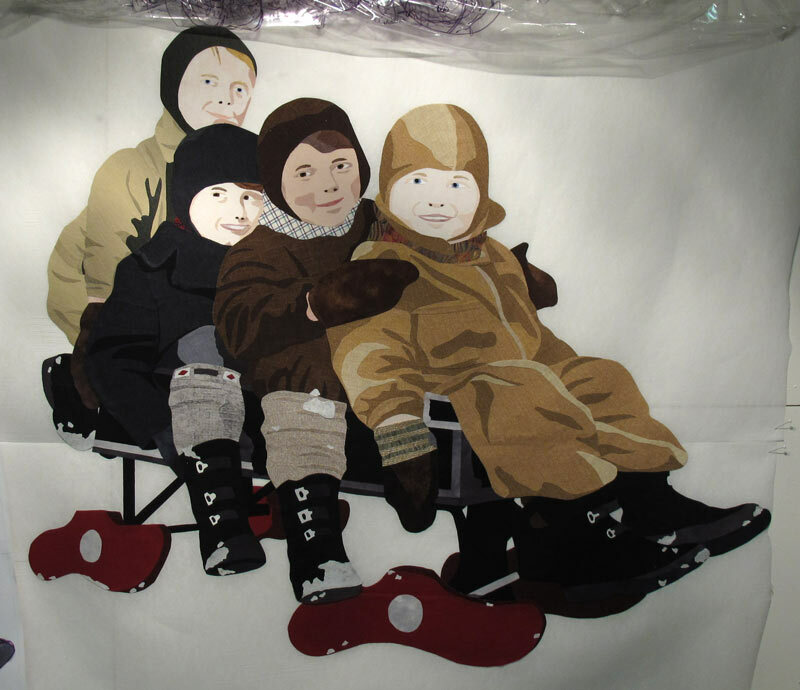 Eyes on the boy in front of sleigh have added detail. 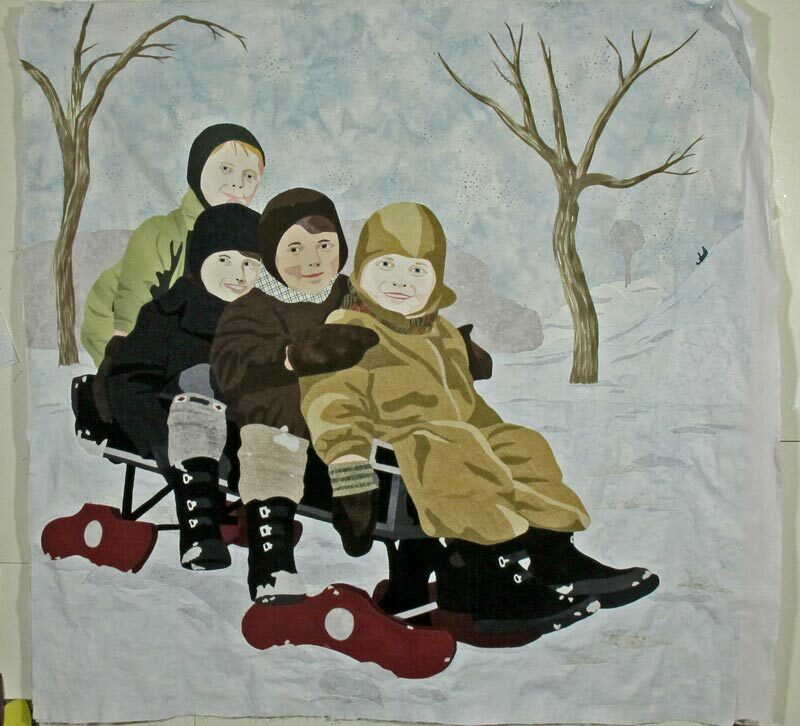 This entry was posted in Portraits, Uncategorized and tagged children, fusible applique, portraits, sled, sleigh, vintage clothing on June 14, 2015 by Valerie Wilson. 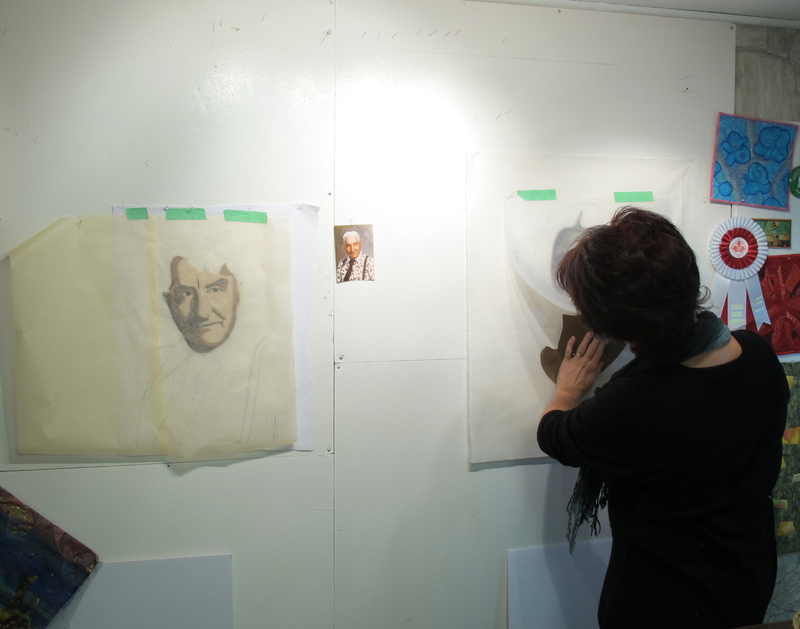 A recent class on Portraits was a lot of fun, and the students did some really great work! They were a quiet group, as they were concentrating hard! 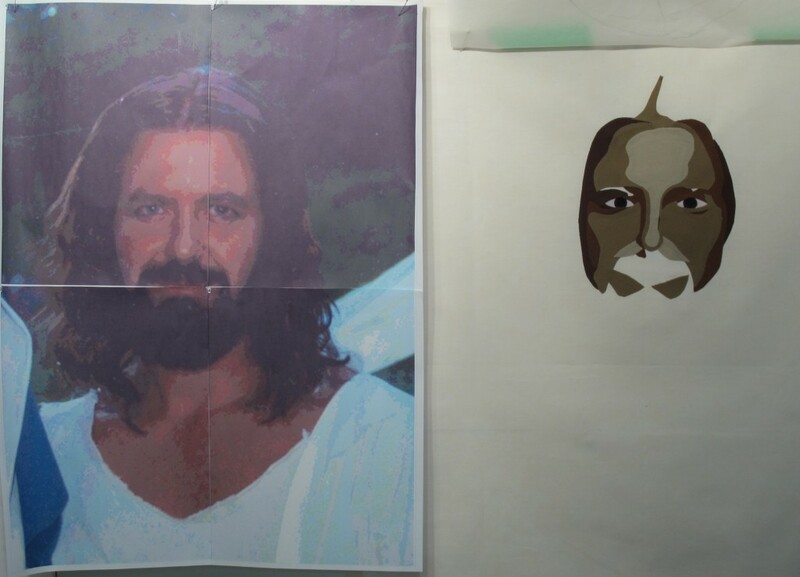 They started by making a tracing of their enlarged photos. 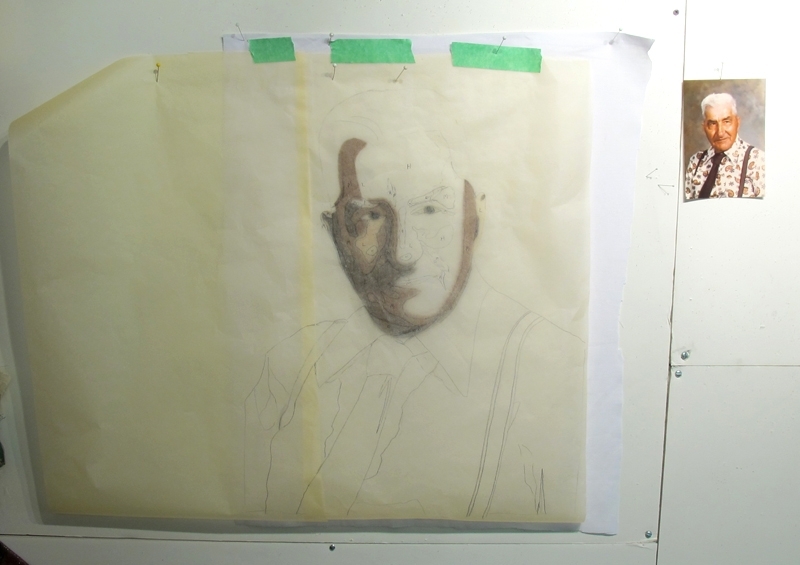 The tracing is shown here used as the overlay, for help in positioning the pieces of the portrait. 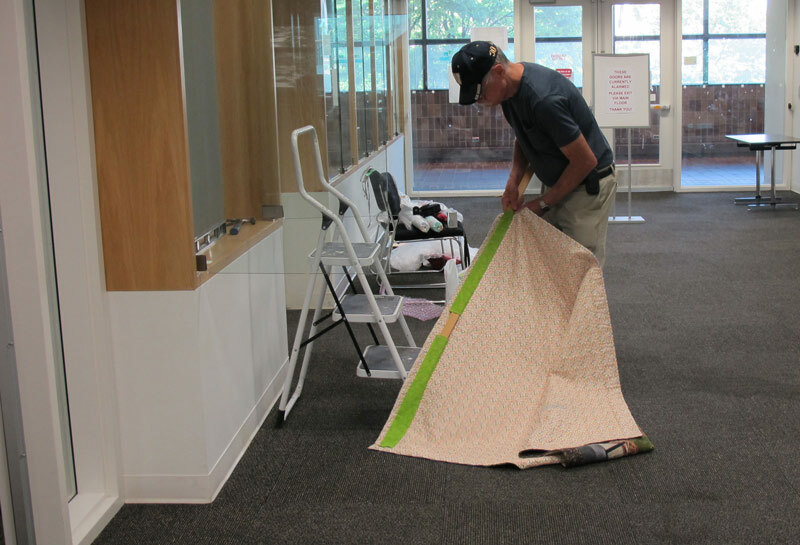 They then progressed to adding small pieces of fabric, like a jigsaw puzzle, to a base fabric. Adeline was doing a portrait of her grandfather. Adeline found some great fabric, that mimicked the 70`s print, that was in her grandfather’s shirt in the original photo. 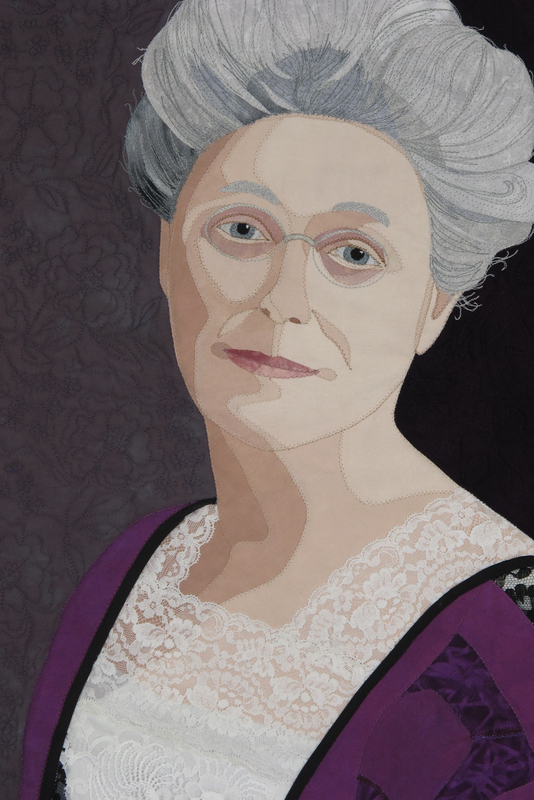 Her portrait looks great now, but will look even better, when the final details are added with the stitching! Of course, this portrait is still in progress. Here Ricky was auditioning fabric for his hair. 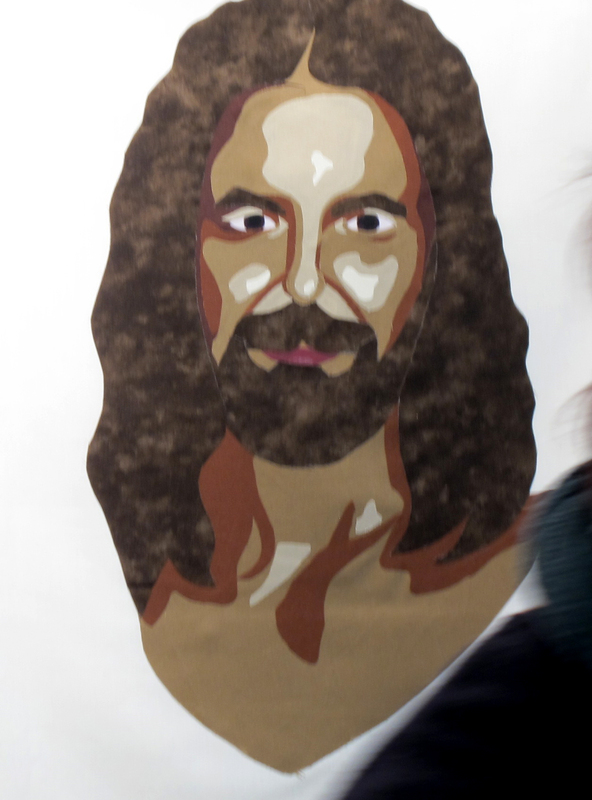 Helen chose a photo of a friend, who had been in a Passion play with her. Although, the fabrics that she had brought to work with were a little on the green side, they made for a dramatic portrait. Adeline said that she had had a lot of fun and learned a lot. I can hardly wait to see the completed portraits! 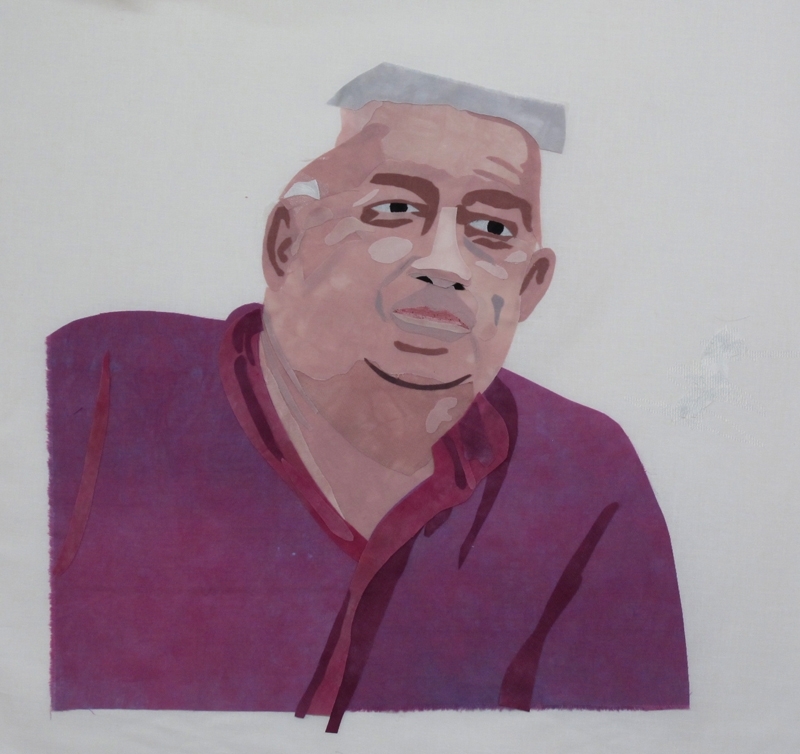 This entry was posted in Portraits, Uncategorized and tagged classes, fabric, portraits, vintage clothing on December 1, 2014 by Valerie Wilson. 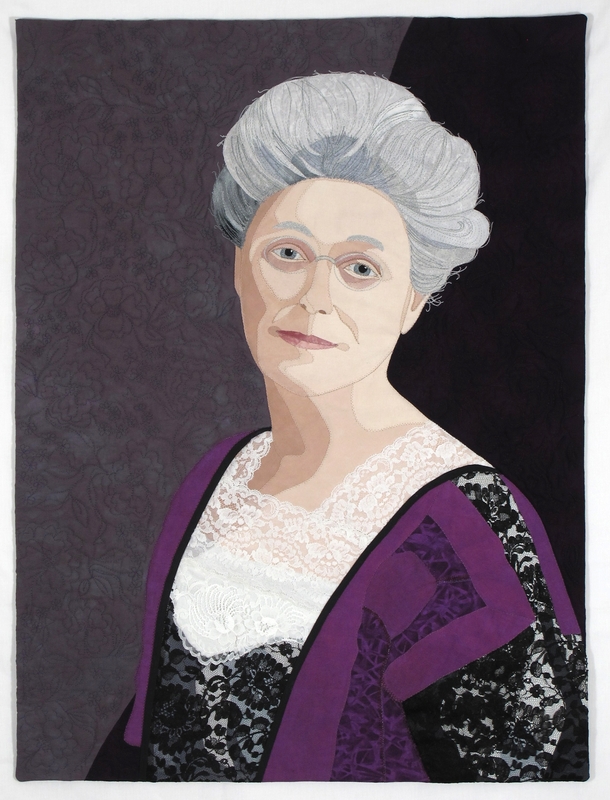 This woman is the subject of my latest portrait, painted in fabric. I loved the photo of this woman as she looked so regal, and had just a hint of a smile. I decided that she needed a rich colour for her dress; and chose a deep burgundy fabric that I had hand-dyed. It took a lot of searching to get the lace for her dress. I wanted a good quality lace in white, and a large enough size to fill the bodice area. I ended up using two pieces of lace for the front of her dress, to get the look that I wanted. I glued the lace on using tiny drops of fabric glue to get it to stay in place, until I could sew the edges. I debated what motif to use for the background as I wanted a vintage look. A friend Julia, from New Zealand, suggested trying to use the motifs from the lace. 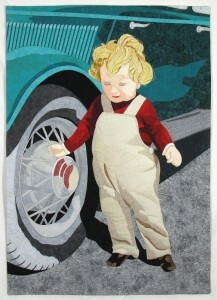 It worked out really well, with a few ideas from a fabulous book called Doodle Quilting by Cheryl Malkowski. This is a great book for learning how to start free motion quilting and then how to combine different motifs. You can find the book here. 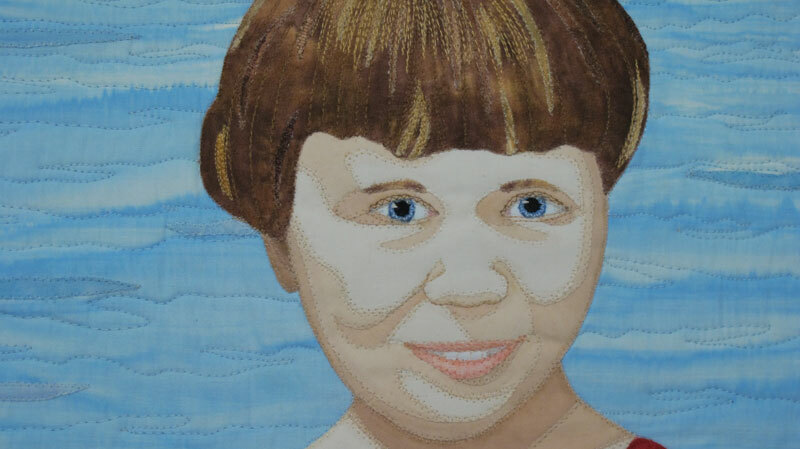 I stitched this lady’s hair extensively as I wanted the upswept look and the little wisps sticking out. I am now on to my next portrait. 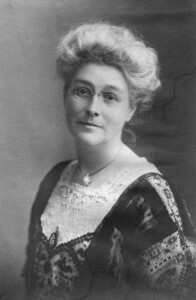 Another portrait of a lady. This one in a white debutante gown. I’m not sure about doing a white dress, but I will give it my best shot! This entry was posted in Portraits and tagged lady, portraits, vintage clothing on November 6, 2014 by Valerie Wilson. My latest portrait is done! This little girl looks as though she has just started walking, and is delighted to be able to get around on her own. I was thrilled to have it finished! The next thing then was to decide on a title for this portrait. I have a difficult time naming quilts. Do you? My husband suggested “Spokesperson”. Funny, but no. After some deliberation, I finally decided on “Stepping Out”. I did some research on the car, to try and date the photo. I love researching the details! It helps to bring the person, and the piece, to life. I found out that this car was probably a 1920 – 30’s car. 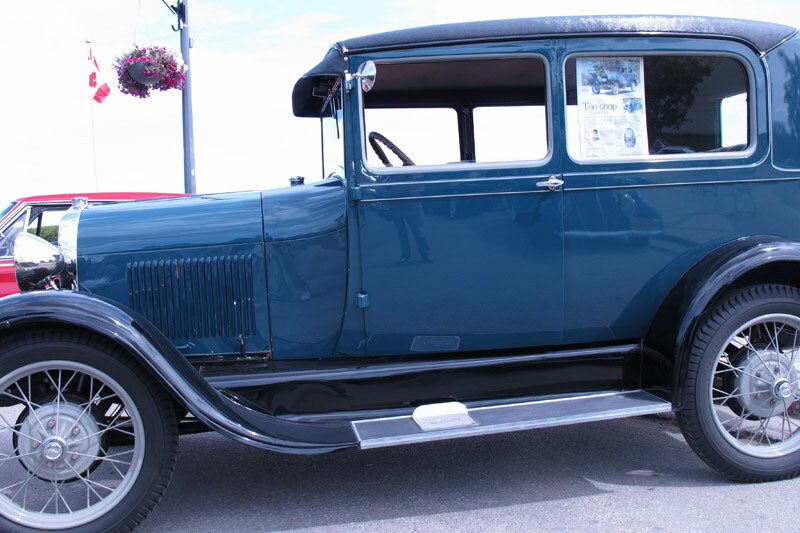 Then at a recent vintage car show in Selkirk, MB I found a 1925 model, beautifully restored! I was thrilled! I took several photos and used these to help with some of the details that were “flashed out” in the original photo. One major part of this quilt was done twice, to get the look that I wanted. I redid the entire car as I decided that, although looking great, it was too bright in relationship to the little girl. I wanted the girl to be the focus, not the car. I find that I always resist changing anything, as I see all the work that needs to be done again. I try to talk myself out of changing anything. So I go away for a break, and as soon as I get back, I look at the portrait. If something is still bugging me, I resolve to change it. I am always happier with the result in the end. I then take a deep breath, and just start. Have you ever had to redo part of your quilt? How did you meet the challenge? Do you have any advice for people facing the same situation? This entry was posted in Portraits and tagged children, fusible applique, portraits, vintage cars on September 11, 2014 by Valerie Wilson. This is my latest portrait in progress. I have done more work on it since I took this photo, so this is only a teaser. This little girl intrigued me from the first moment that I saw the photograph. She is just starting to walk, dressed in her rompers (puffy looking, probably from her diaper underneath), her hair sticking out in all directions and holding on to the spokes of this 1930’s car. She is just so cute! It brought back memories of photos that my parents had taken of me and my family. I always wonder what the story is behind the photo. 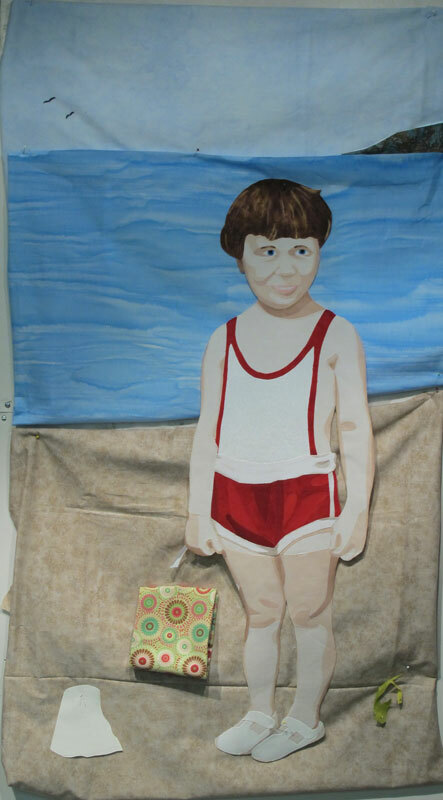 The original photo was quite small – only 2″ x 3″, so I enlarged it, so that the child would be closer to life size. The larger size also makes it a lot easier to recreate the details. This piece will finish at 25 1/2″ x 35 1/2″. When I start on a new piece, I choose the details that I think are most relevant to the picture, and then decide on the values (e.g. light, medium and dark), and finally the colours that I feel best fit the scene. I wanted the little girl to stand out and be the focal point, so I chose a bright red for her T-shirt. The car will be a blue-green, to complement the red. 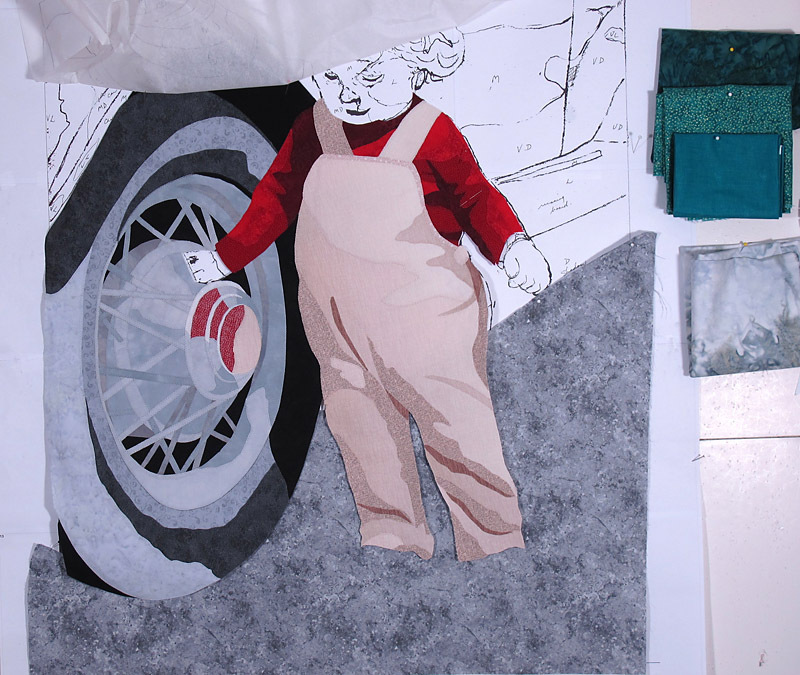 You can see some of the fabrics, that I am thinking of using for the car, on the right side of the photo. 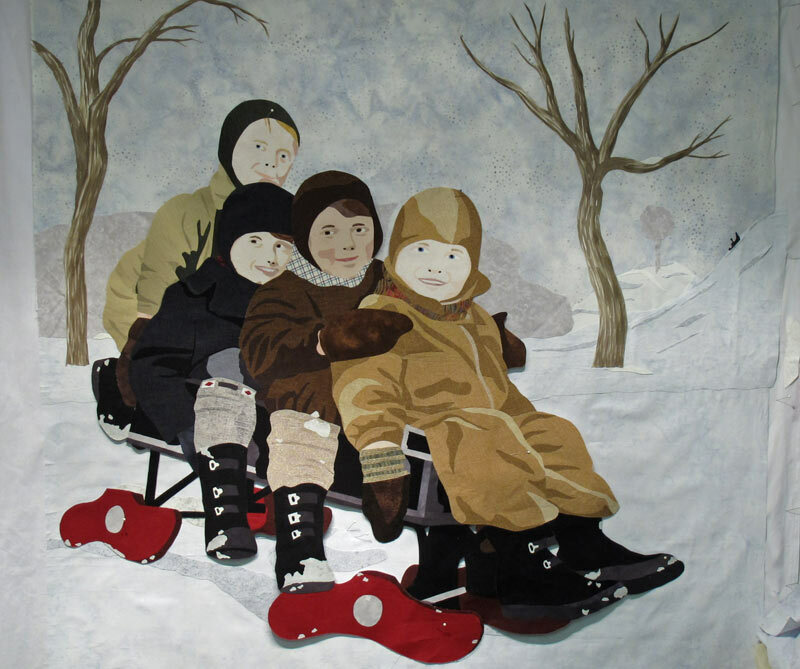 The method that I use to create my art is fusible applique, where a sticky film is adhered to the back of each piece of fabric, and then the pieces are assembled like a puzzle to create the picture. Once the picture is complete, it is ironed to fuse it and to keep everything firmly in place. Then, I add stitching to add further detail, and finally quilt the piece to add dimension. I am looking forward to getting the car started! 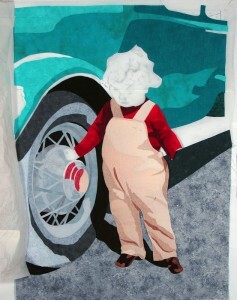 This entry was posted in Portraits and tagged cars, children, fusible applique on September 4, 2014 by Valerie Wilson. 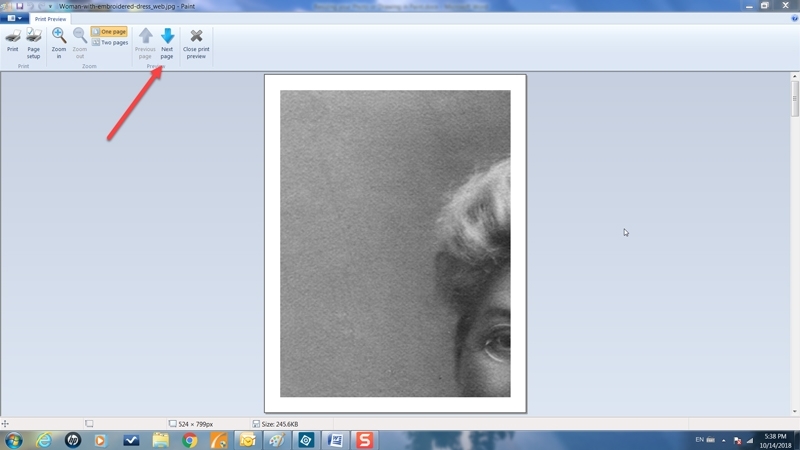 You will receive a PDF copy of my checklist full of helpful hints on “Choosing a Photograph for your Portrait”. These hints will help you to confidently pick a photograph to use when creating your own portrait.